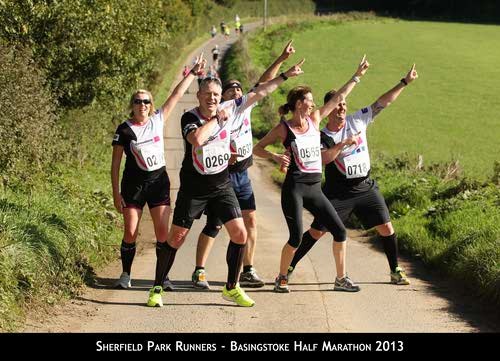 It’s been quite a while since my last blog post but I’ve lots to say about my running and the running club I co-founded in April last year – Sherfield Park Runners! In October, I completed my third ever half marathon in Basingstoke – training had been intermittent to say the least due to a number of reasons, and right up until the actual day I wasn’t quite sure I was actually going to run! But I did, and with the support of my partner and some other club members, I sobbed through the finish line in 2 hours, 25 minutes and 17 seconds absolutely exhausted but having beaten my Fleet half marathon time in March of 2 hours, 34 minutes and 33 seconds. Strange really as Basingstoke is a far hillier course than Fleet, but I believe that the training I’ve done with the club has made me fitter, stronger and far more resilient, and mentally able to cope with longer distance running. Having said I’d never run a half marathon again, I have entered 3 so far this year – Reading, Fleet and Basingstoke. And once open for entries, I also plan to run the Bristol half too. Think I’m addicted to running! It’s strange because at school I didn’t enjoy PE at all! In fact I’d use any excuse to get out of a PE lesson if I could. I first discovered running in around 2003. I started walking, then power walking, then walking and jogging then actually jogging for 30 minutes and beyond. My running was then very on an off until October 2012 when I decided I needed to exercise regularly to benefit my overall health, particularly as I’m not getting any younger! Running keeps you fit – cardiovascular exercise, such as running, is a fantastic way to increase your fitness as it raises your heart rate and strengthens your heart muscle. Experts have shown that cardiovascular exercise can also reduce your risk of heart attacks, angina, high blood pressure and stroke. Running can help to manage your weight – running burns calories. I ran 8.3 miles on Sunday for 1 hour and 35 minutes and burned 1155 calories. Once you start running regularly, your body composition/shape can change. Basically you will start to lose fat and lean muscle tissue will build up instead. Running is good for your bones – running helps to build strength in your bones. It may even help to slow down the natural loss of bone density that happens with age. I have dodgy knees but since I’ve been running regularly I’ve had less aches and pains. Running is good for your mind – there are many documented benefits of exercise for mental health. It’s an amazing feeling once you start building up those miles to experience the ‘runner’s high’ / feelings of elation and increased energy – the feeling you can do and achieve anything. There is also evidence that exercise can improve sleep. I can certainly vouch for that, as I experience the best night’s sleep after a long run or an intense training session. If I’ve had a busy or stressful day I also find running helps me to relax and relieve the tensions of the day. Running gives you time out – I love my running time. Time to think and be me – out in the fresh air on a crisp winter’s morning or on a summer’s evening when the sun is going down. And when I run with friends in the running club, it’s a chance to chat and catch up too. So what else am I up to with my running and Sherfield Park Runners this year? As a club, we are growing. We’re up to nearly 60 members of all ages and abilities and that number is set to get even higher this month with new interest from a wide range of people. Starting next week, I am launching a beginners running course. This is a fantatic opportunity for those who have thought about running but don’t know where to start, or for those who want to run but not on their own. The Sherfield Park Runners Couch to 5k has attracted interest from over 30 people in my local area, with over a third of these now committed to starting the course on the 29th. Lasting for 9 weeks, the aim of the course is to get everyone running a 5k comfortably and confidentally and with the better weather on its way towards the end of March, the plan is for all those who complete the course to run the Basingstoke 5k parkrun.